Battle of the Alamo, a Mexican soldier's eyewitness account. I've always believed that when you try to acquire information about events that happened years ago; the best thing to do is look for eyewitness accounts first and foremost. It makes no difference to me what some would-be modern day historian thinks or says about any historical event, I want to hear it from the ones that were actually there or participated. 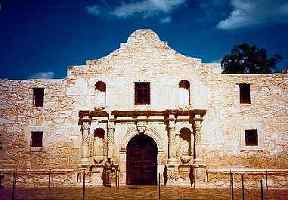 There were eyewitnesses to the Battle of the Alamo. Letters were written; daily diaries and journals were kept. Certain individuals in both armies saw fit to write down in some form or another what they saw and experienced during this terrible time. It is interesting to look at this battle through the eyes of the Mexican soldier. The men in the Texas Army were fighting to defend their families, land, and rights as they felt were guaranteed to them by the Mexican Constitution of 1824. The Mexican soldier was defending his country. We get an observation of Colonel William B. Travis by a Mexican officer as he witnessed Travis' actions during the battle. In his book With Santa Anna in Texas, Jose Enrique de la Pena, a Lieutenant Colonel in the Mexican army, described Travis as follows: "He would take a few steps and stop, turning his proud face toward us to discharge his shots; he fought like a true soldier. Finally he died, but he died after having traded his life very dearly. None of his men died with greater heroism, and they all died." The attack was made in four columns, led by General Cos, General Morales, Duque de Estrada, and Romero. I marched under the immediate command of General Cos and tell you what I saw. After a long wait we took our places at 3 o'clock A.M. on the south side, a distance of 300 feet from the fort of the enemy. Here we remained flat on our stomachs until 5:30 (Whew! it was cold) when the signal to march was given by the President from the battery between the north and east. Immediately, General Cos cried "Foreward" and placing himself at the head of the attack, we ran to the assault, carrying scaling ladders, picks and spikes. Although the distance was short the fire from the enemy's cannon was fearful; we fell back; more than forty men fell around me in a few moments. One can but admire the stubborn resistance of our enemy, and the constant bravery of all our troops. It seemed every cannon ball or pistol shot of the enemy embedded itself in the breasts of our men who without stopping cried: "Long live the Mexican Republic! Long live Santa Anna!" I can tell you the whole scene was one of extreme terror ... After some three quarters of an hour of the most horrible fire, there followed the most awful attack with hand arms ... Poor things - no longer do they live - all of them died, and even now I am watching them burn - to free us from their putrification - 257 corpses without counting those who fell in the previous thirteen days, or those who vainly sought safety in flight. Their leader named Travis, died like a brave man with his rifle in his hand at the back of a cannon, but that perverse and haughty James Bowie died like a woman, in bed, almost hidden by the covers. Our loss was terrible in both officers and men. Every year on the anniversary of that historic struggle, various historians and writers give their opinion of what happen at the Battle of the Alamo. Regardless of what they say, the fact remains that this was a horrible battle and many brave men in both armies died for a cause they believed in. I think we owe it to those brave Texans and Mexicans who fought each other so long ago, to keep their honor and memory alive by telling their story as accurately as possible.